The end of 2018 is in sight. You’ve been on top of your financials all year long. However, it’s important to look in the rearview mirror for just a minute and go over a few things before you officially close out the year. It’s time to double-check some items to ensure compliance and minimize the tax burden on your dealership. These items would benefit from being checked one more time. We’ve addressed the full list in a webinar we just released here. Now, on to the things you might not know inside and out. These items are essential for tax planning purposes. Your dealership could be eligible for the new 20% deduction on the qualified business net income from partnerships or S-Corps. In the past, paying your taxesthrough withholdings or estimated taxes carried the same weight. With the new tax law, a combination of both could minimize your tax obligation. To figure out how to balance how much money goes to each option, it’s best to talk to us about it. Bonus depreciation is not available in 2018 to dealerships that pay floorplan interest and have greater than $25 million in gross receipts. One popular option is putting the real estate in a separate real estate entity that doesn’t have floorplan interest. But, the federal government is considering closing that loophole. It may not effect your 2018 taxes, but we’re monitoring it so we can advise you in the best way possible for 2019. The other change we’ll mention is the increase in standard deductions. With this increase, your more common itemized deductions may lose value. So, consider bunching deductions like charitable contributions. We’ve seen groups doubling their donations to their favorite charities this year, so they get above the standard exemption- and forgoing next year’s gift. We have just a few items of note on your reporting and compliance measures. All individuals who are given a demo vehicle should sign a written demonstrator policy agreement. At this point, not all of you are doing this. Brady Ware can help you identify the best method because the IRS has approved four different methods. Travel expenses are deductible in full, but certain meal expenses are limited. Costs related to holiday parties, office snacks, promotions, and on-site employee meals are not limited but should be posted to a separate account. And one final note, entertainment expenses are no longer deductible. This includes expenditures for amusement, recreation and membership dues. 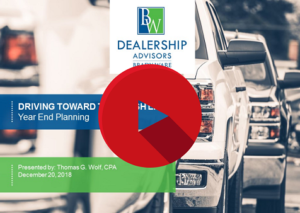 Watch our webinar to help you with the full scope of year-end planning- that way you start the new year on the right foot! Driving forward with a excellent CPA advice in the passenger’s seat. No back seat drivers!